A Seventh Doctor Audio Adventure on a double CD starring Sylvester McCoy, guest starring Timothy West and Amy Pemberton. aquaphobia n. An abnormal fear of water, or drowning. blattodephobia n. The morbid fear of cockroaches. catoptrophobia n. Fear of mirrors, or seeing one’s own reflection. There’s a whole ABC of horrors at Bluefire House – as four young people, drawn together to this tumbledown hotel at the edge of nowhere, are about to discover. But whatever the ancient and foul thing that has emerged from the wilderness to drag them here, speaking of it will only strengthen it. 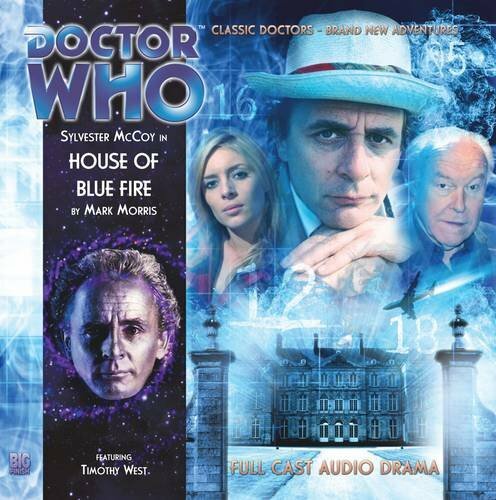 The Doctor alone knows what lurks at the heart of Bluefire House. But the monster of his childhood dreams is coming. The Mi’en Kalarash is coming… Just this once, the Doctor is afraid. A Seventh Doctor Audio Adventure on a double CD starring Sylvester McCoy, guest starring David Schofield. “When the river is gone, ships shall sail in the sky, monsters bring fire from the heavens. All will fall into a grey and endless sea, and Doomsday has come.” Florence, the sixteenth century. No one thought to pay much attention to the prophecies of the so-called seer Michel de Nostradame, otherwise known as Nostradamus. Until the canals of Venice dried. Until the soothsayer’s sayings started coming true… Because Master Nostradamus is right, in all respects. The end of the world is nigh. The ships are coming. The monsters are coming. The fire is coming. There’s only one thing he didn’t see coming, in fact: the sudden apparition of a certain strange Doctor, in his even stranger TARDIS. Today, the Earth dies screaming. And all the Doctor can do is watch. 1934: the TARDIS lands on a snowy island off the coast of Alaska – one that wasn’t there four years, three months and six days ago, according to the Doctor. The island is dominated by a vast, twisted citadel. Inside it, the Lurkers lie dreaming. It’s said when they wake the world will end… Led by the ruthless Emerson Whytecrag, an expedition has come to the citadel to exploit the horrors in its ebon-dark interior. Horrors just like those published in the pages of the pulp magazine Shuddersome Tales, where a hero’s only reward is madness, death… or worse. Horrors that the Doctor and his companion are about to wake up. The year is 2044. Earth is enjoying a Golden Age of peace, prosperity and technological advancement… but somebody is plotting to destroy all that. The Selachians, shark-like alien monsters, launch a crippling attack on Earth’s Moonbase, using deadly weapons from the future. Help is at hand. A police telephone box appears in a Moonbase hangar. A time-travelling hero has returned in the hour of Earth’s greatest need. Now, Elizabeth Klein must fight to save not only the Galactic Reich but Time itself from the mysterious prisoner who has orchestrated these fateful events… the Doctor. “This whole wedding is like making a nuclear bomb with half the instructions missing!” A week-long respite from a prolonged and bloody war, the Festival of the Twin Moons of Tuin makes Glastonbury look like a church fete… or so the brochure says. The Doctor and Ace are looking for rest and recreation. Hex is looking for the beer tent. But eternal enemies the ginger-haired Ri and the coot-bald Ir are plotting to turn their Festival truce to their own advantage. Only the Dark Husband might stop the celebrations turning to horror… but who is the Dark Husband? And what terror awaits him on his wedding night? If anyone knows any just cause or impediment… speak now. The lives of billions depend on it.